1. Pour permanent adhesive into a small dish. Taking your paintbrush, begin brushing on adhesive onto the tip of your feather. 2. In a separate dish, pour the glitter. 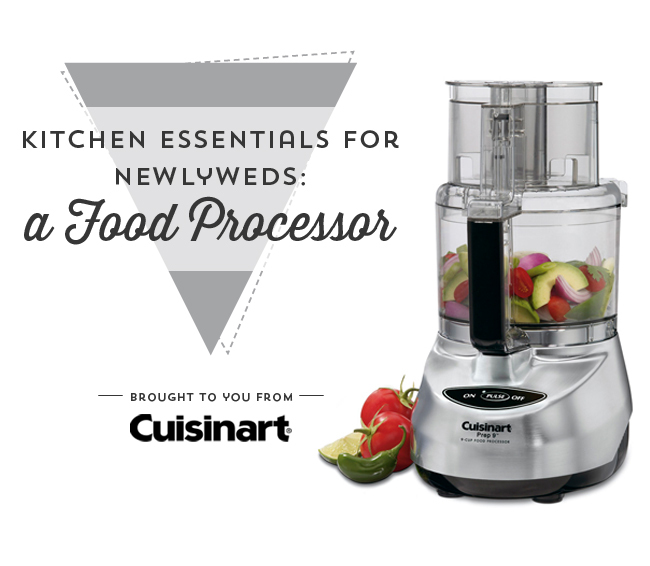 With this dish, dip the tip of your feathers. 3. Your feather is now all jazzed up. Now repeat the steps for all your remaining feathers. Let dry. 4. Once your feathers are dry, take your twine and cut different lengths of string. I cut some strings about 6″, 10″, even 16″ in length. 5. 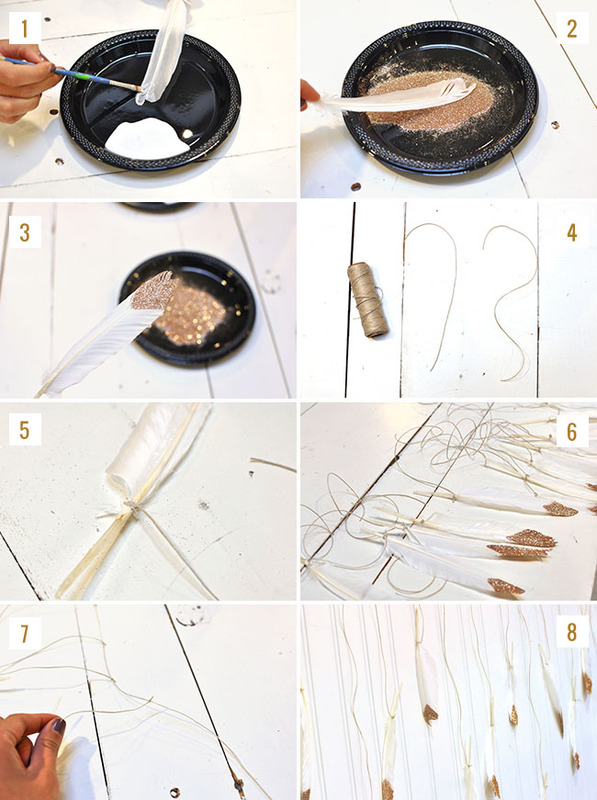 Begin double knotting the strands of twine onto your feathers. I even applied a dot of adhesive for extra hold. 6. 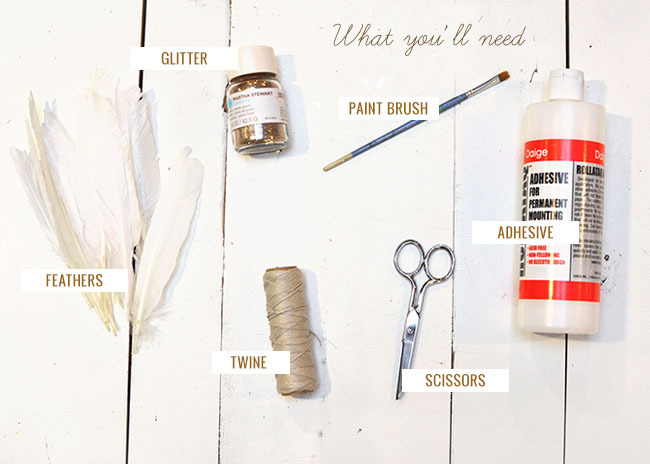 After all your feathers are nicely glittered and knotted, begin tying them on to a larger piece of twine. 7. 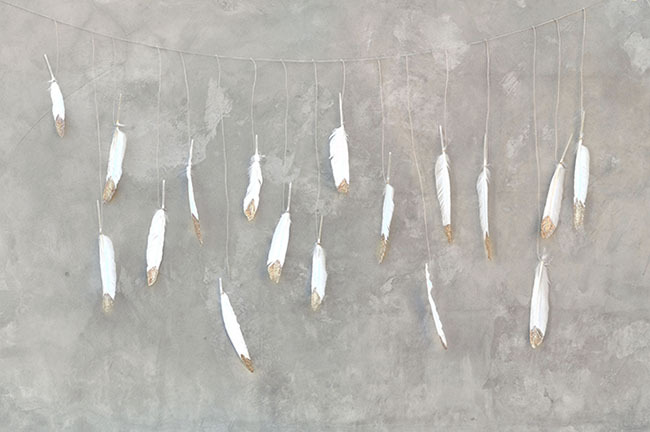 The larger piece of twine will run horizontally while the feathers hang vertically. My string measured about 90-100 in. 8. Now that all your feathers are hung on a string, you may use your garland anyway you like! 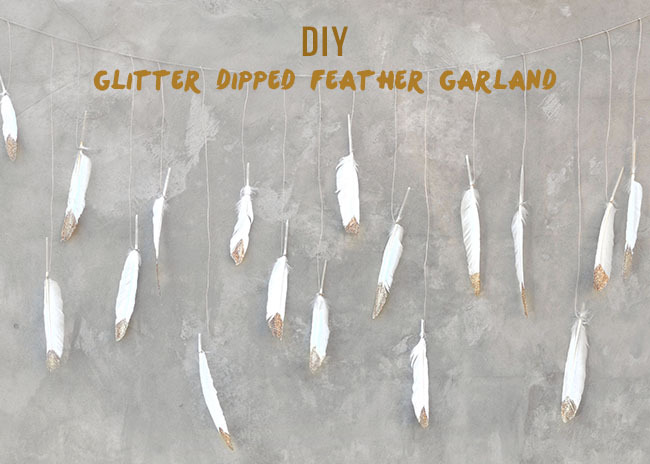 And remember, we love seeing our readers take on our DIY projects, so be sure to share with us on Instagram using the hashtag #GreenWeddingShoesDIY if you create a glitter dipped feather garland for your wedding or next party! Indeed, a unique and fabulous idea that could really stands out in a rustic wedding! Love the color! and it’s easy to make it,i will try this! Thanks for this great idea !! It’s quiet easy to make yet awesome idea !!! Such a cute idea, this would look ethereal and lovely! Thanks so much for sharing!